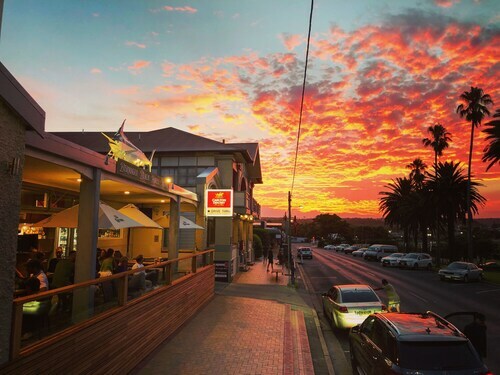 Situated in Bermagui, this hotel is within a 5-minute walk of Bermagui Beach and Bermagui Visitor Information Centre. Bermagui Country Club and Blue Pool are also within 10 minutes. 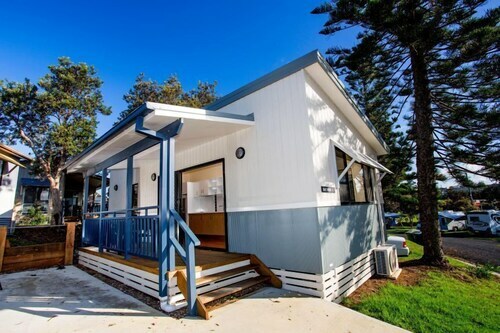 Situated near the beach, this motel is within a 5-minute walk of Bermagui Visitor Information Centre, Bermagui Beach, and Bermagui Country Club. Bruce Steer Pool and Bermagui Harbour are also within 10 minutes. Situated in Bermagui, this golf motel is within a 5-minute walk of Bermagui Country Club and Bermagui Harbour. Bermagui Fishermen's Wharf and Bermagui Visitor Information Centre are also within 10 minutes. Situated on the riverwalk, this apartment building is within a 10-minute walk of Bermagui River Park and Bermagui Harbour. Bermagui Fishermen's Wharf and Moorheads Beach are also within 15 minutes. In New South Wales, the charming and attractive fishing port of Bermagui sits on the stunning south coast. With incredible beaches right on the doorstep and lush national parks close by, it is no wonder that more and more people are starting to visit and discover the area’s many charms. The town has managed to keep a relaxed and peaceful vibe, creating the perfect atmosphere for a wonderful holiday. With lots to see and do, why don’t you discover the many delights for yourself? Book your Bermagui accommodation with us and get set for a great vacation that the whole family will love. Known for its incredible deep sea diving it’s perfect for a great catch. With the beautiful Wallaga Lake nearby, you can go for a swim, kayak or just walk around the lake and take in the natural beauty of the area which holds historical significance. You should take a tour of Montreal Goldfield located on the Wallaga Lake Road, a historic tribute to the mining of alluvial gold. Bermagui Seaside Fair is one of the main events in town. Held every March you can enjoy fireworks, sandcastle building competitions, sports, stalls, games, clowns, live music, food, cultural performances … and more! At other times of the year visitors can enjoy excellent spot of fishing. Take a stroll along the Fisherman’s Wharf to see the hustle and bustle of a working area and dine on fresh and tasty fish and seafood. Chill out on the beaches, swim in the sea, surf, and try a number of different water sports. If you want a nice all over tan head to Armands Beach! There are heaps of lovely coastal walks and the Blue Pool is a must. Sitting at the foot of a craggy cliff, the rock pool is filled with the most brilliant blue water. The national parks offer bush walking, bird watching, and nature galore. Switch off your phone, leave your watch in your hotel, and enjoy the feeling of complete freedom. Camel Rock is an interesting rock formation that makes for beautiful photos, and for more natural works of rock art head to Mimosa Rocks National Park. Check out the surrounding scenery at Cuttagee Lake which is also well worth a visit. There are wineries, vineyards, museums, and galleries to explore. Further afield, why not sample some local cheese and wine in the stunning rural towns of Bega or Eden? Or take to the water on board a boat in Merimbula, another great local seaside town filled with beautiful beaches and tasty seafood? Treat yourself to a stay in beautiful Bermagui with one of our lovely Bermagui hotels. Get there fuss-free with a cheap flight to Merimbula. How Much is a Hotel Room in Bermagui? Hotels in Bermagui start at AU$63 per night. Prices and availability subject to change. Additional terms may apply. Beautiful cabin and location. Very clean & relaxing and had everything I needed. Wonderful location, right across from the Surf Club. A lovely lady greeted us, warm and inviting and made us feel welcome. Great place to stay, highly recommend this accommodation.